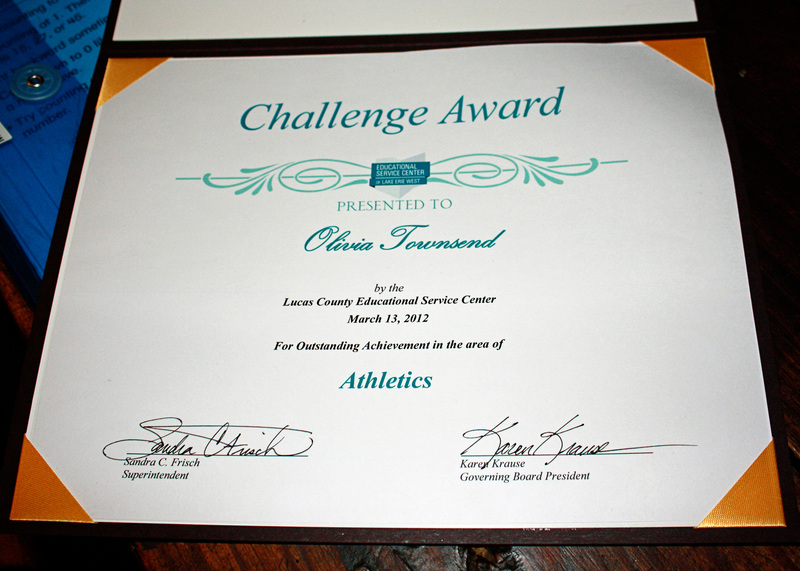 Last week, Olivia was honored by our county educational service center for her achievement in athletics. Did you just crack up like we did? Athletics? What? Yes!!! Olivia’s occupational and physical therapists nominated her for the award because of how hard she’s worked this year in learning how to jump. We were very excited and proud! Here’s the link to the article in our local newspaper. She was really cute about the whole thing. She walked right up, took her award and when we said “hold it up”, she hoisted it above her head for everyone to see. 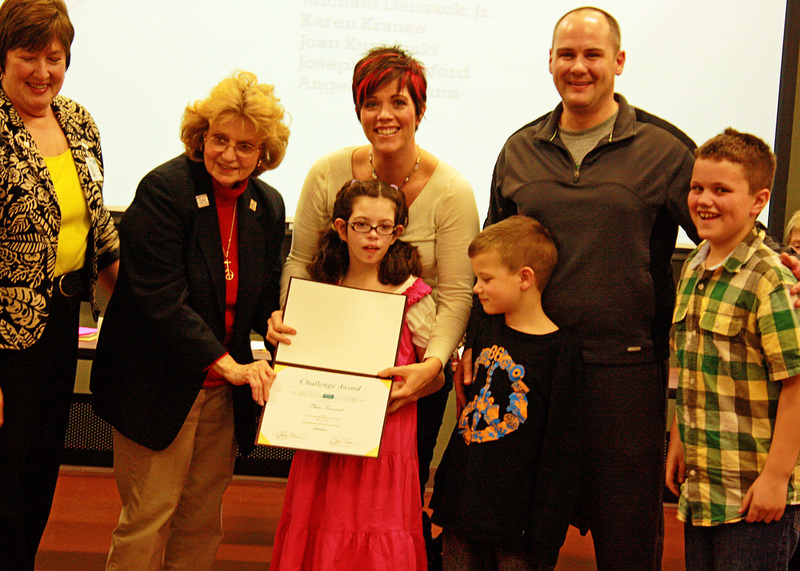 Her principal, therapists and aide all came to the ceremony too. We were so proud! 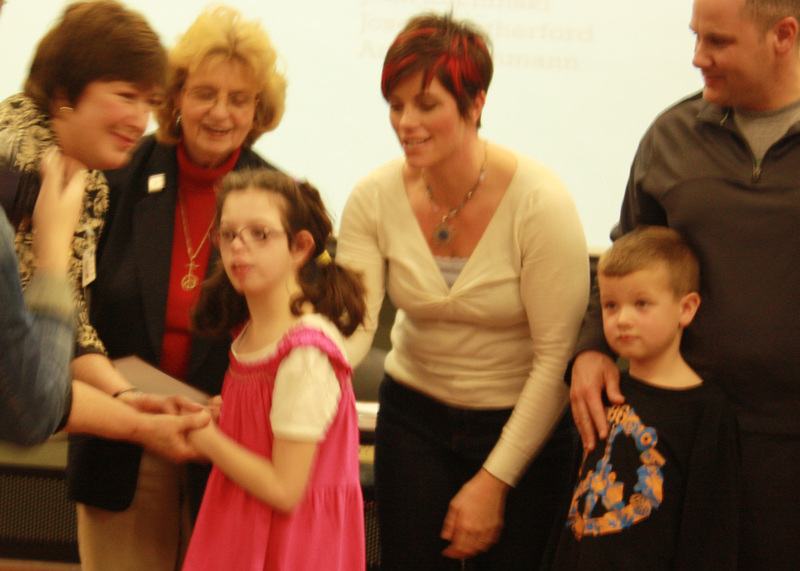 I just want to focus on Olivia (and not the less than stellar reporting) because she is a rock star! I am so happy that her therapist nominated her! Her work learning to jump is Olympian! So I am doing a happy dance for her. Your hair is really cute, BTW! so we can lose chromosomes now? excellent…. Congrats to Olivia on her awesome award. 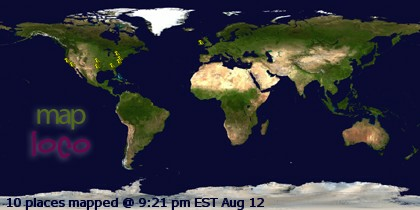 How exciting for all of you. Congratulations to Olivia! And I must say, again, I LOVE your hair! Congrats to Olivia! What a wonderful award. Now THAT is super awesome. Again I say “way to go Olivia!! !” And I’m still dying over that article!